More and more data is being made available for the public. It is also an important tool for international development. But as we create more and more impressions – location, searches, likes – how do make sure privacy is protected? Especially in emerging markets where digital education, privacy laws have not been tested until more recently? Meikle* (2016) breaks down the concept of social media into five key words in order to make it more understandable. They are networked, database, platform, public and personal communication. It has become a catch-all term but the digital processes and social behaviours behind it are nonetheless complex, and can be leveraged in different ways. As Meikle puts it, ‘Not all contemporary internet phenomena are social media’. Wikipedia, Uber, Netflix etc are not necessarily social, but what is interesting is that many of these Web 2.0 services, if not all, are reliant on databases. This final blog post will touch on how databases can be used for international development and how opening up the data contained within to developers can have rather positive effects. A lot of work is currently being to create an open data community. One example such as the the Code4Kenya project ‘an outreach initiative, supporting intermediaries to work with datasets and to develop applications and services which make data more accessible’. It has 430 Government data sets that are open to the public. Another example being the recent Open Data Festival held in Myanmar. 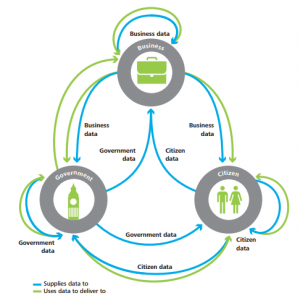 Much of the work is centred around opening up ministerial data sets, or that of international development projects. ‘Open data also offers opportunities to better evaluate, monitor, and respond to the initiatives of other development partners, including private sector’ says the Mekong region open data Wikipage. But where I think a lot of potential lies is in the practical application of open databases from other sources. In a previous post I touched on how Uber shares its trip data publically. Whilst that may have not yielded the results people were hoping, the experiment serves as a model for the future. Once the private sector takes seriously the promise of the ‘innovation and business growth potential open data can unlock’, then resources will be funnelled towards it. Yes there will be fears over security, privacy and the for-profit agenda of private businesses, but these can be overcome once trust is built. I think that purely relying on the SDG process and Government involvement will mean that open data will not see the speed of change that is required. Of course, leveraging the private sector is already happening, and that will make these championed open data ‘ecosystems’ a lot more green. The there also need to be checks and balances, which is why creating a healthy culture of sharing databases, make it social will really make it a success. *Meikle, G. 2016: Social Media: Communication, Sharing and Visibility. Abingdon: Routledge. Previous PostHas there been a ‘data revolution’ for a post-2015 world?Next PostHope falls flat?